September is finally here and with it comes thoughts of transitions. For me, these transitions include going back to school and settling into a routine that is very different from the laid back summer schedule I so adored. Unfortunately, the one thing that I wish would transition, the weather, never does here in California. As I start to see people layering up and wearing more muted colors on their blogs in other regions of the country, I realize that here in Los Angeles the temps actually feel more like summer than ever. The heat in Los Angeles makes it easy to dress like it's perpetually summer, but I'd like to find a way to transition a little bit to something with some semblance of autumn. 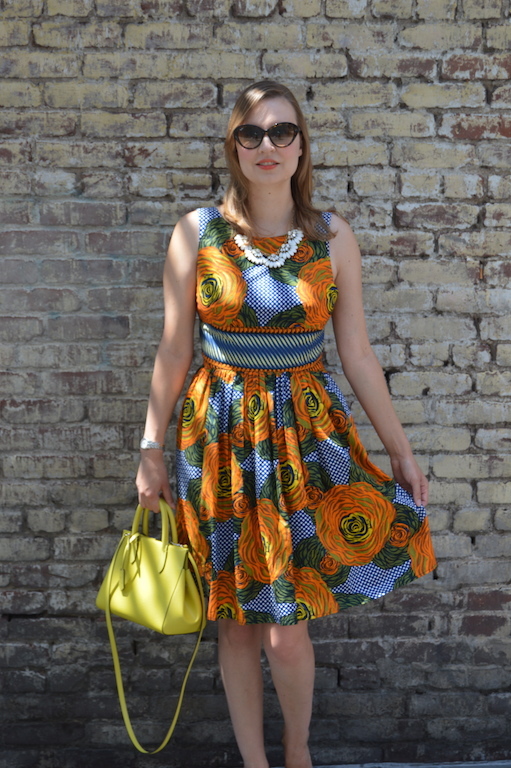 I think the above dress is plenty summery and perfect for the heat wave we are having right now, but the colors of navy, green, and orange are actually perfect for fall. I was so excited when I found this dress that retails for close to $300 at Antropologie for under $50 a couple of weeks ago in store with my birthday discount. The color palette will work well in the upcoming fall and winter months with a sweater on top and maybe even some navy tights and boots when it gets "chilly". Right now, anything I can transition into the fall and winter months and get year round use out of makes me quite delighted. How are you trying to transition between seasons wardrobe or otherwise? I LOVE that dress! What a great deal too! The colors and print are gorgeous! Thank you Jill! 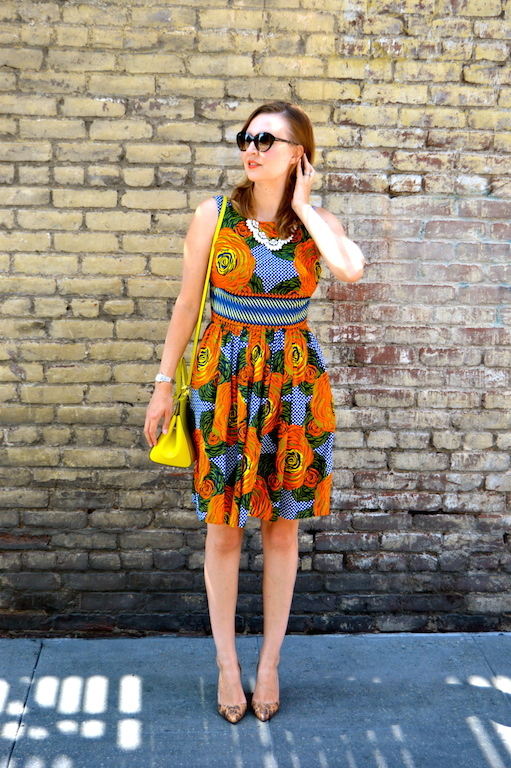 I am definitely in love with this print and the color palette! Can you tell me the maker of the dress? It's absolutely beautiful and now I need to stalk it on eBay. The designer is Mille Collines and they are based in Africa. 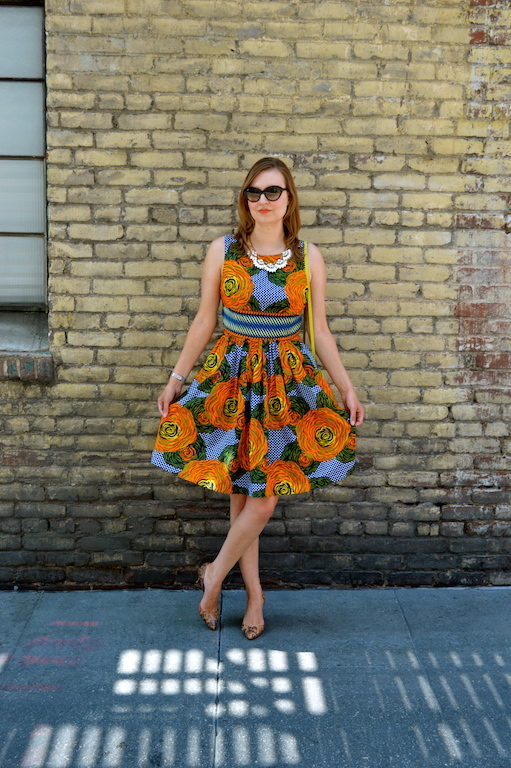 I couldn't find the exact name of this dress anywhere online, but the company does have a website. You might be able to find it on eBay or a similar dress through the company. Just a quick note, in my opinion this dress does run a little small. Good luck tracking it down! Actually, I did find the name! It's called the "Moon Rise Dress" and they do have it on ebay! What a pretty dress. Love the large orange rose print. The colors are perfect for Fall especially paired with Leopard. Good job! 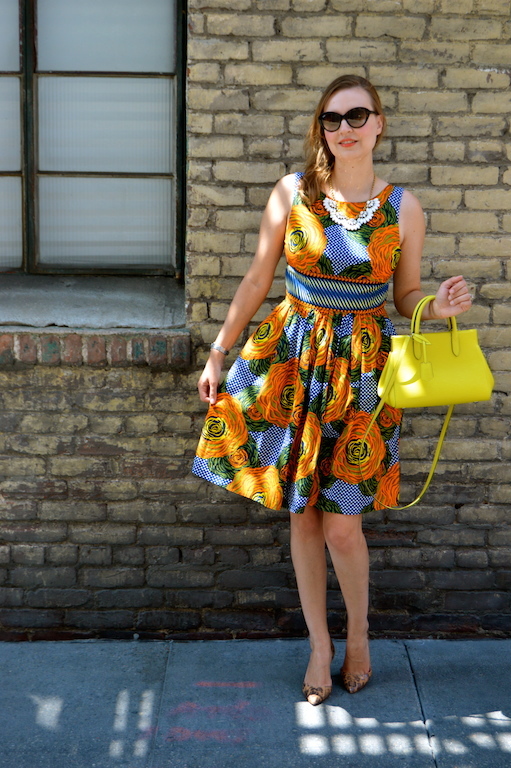 Yes, the print is so fun and perfect for fall. I thought I would bring out the wildness of the print with the leopard pumps. I LOVE that dress! What a score! Thank you Suzanne! I was definitely lucky to get such a great deal! Thank you Kim! 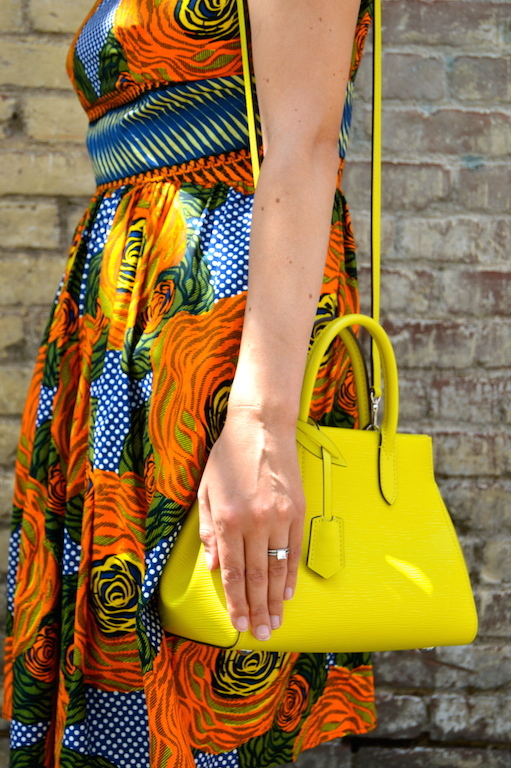 I am also really in love with the bold colors featured in the dress. Great price on that dress! The colors are amazing! The weather in California is so confusing! haha... I feel like it should be getting cooler but it just keeps getting hotter! Thanks! I agree about the weather in California. It's incredibly hot one minute then cool the next. I wish it could make up its mind as it makes dressing very difficult! This dress is just beautiful! 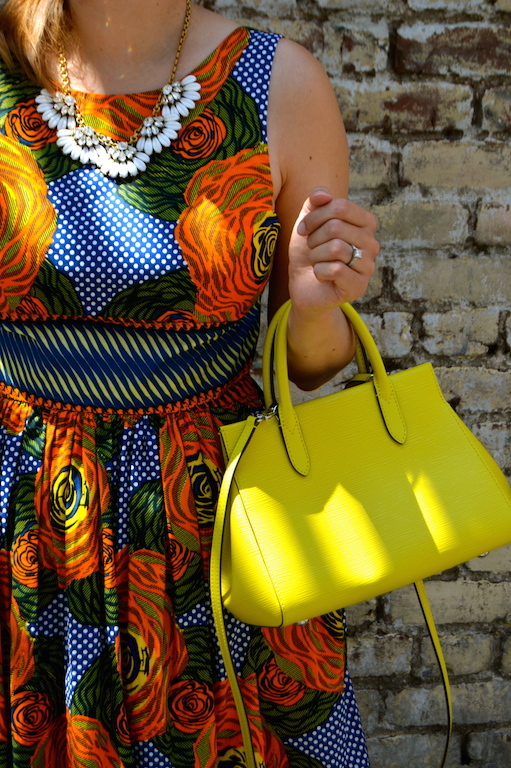 Love the pop of color from your yellow bag, too! Really lovely! Thank you! I wasn't quite sure which color to wear with the dress (as there are so many to choose from) but I am definitely glad I opted for yellow! Thanks for stopping by! What a beautiful dress and since I live in OC, I am with you on transition into fall with colors rather then cozy sweaters. Such a cute dress! Love the print and colors! Very cute shoes with the dress and what a bargain find that dress was. I like the contrast between the big flowers and the dots. Hi, how much smaller does this dress run? I'm considering buying it on eBay but saw that it runs small, how many sizes did you have to go up? I actually went up about two sizes. I am normally a 4, maybe 6 in Anthro and I took an 8 in this one. It definitely does run small. Good luck!